We’d love your help. Let us know what’s wrong with this preview of The Three Thorns by Michael Gibney. To ask other readers questions about The Three Thorns, please sign up. It was about three orphans who band together when a bunch of guys tried to kill them. They end up traveling to a new magical world and find out that they have special powers and are part of a prophecy that says they will bring down the evil emperor. I liked how there was lots of action and adventure. There wasn't just talking all the time. There were a lot of fight scenes, and it never got boring. Tommy was my favorite. He was the oldest of the kids, and he was really mean when the story started, but he changed over the course of the book. He has assassins and a big army. You don't really see him to much. You mostly see the big scary assassins that are nine feet tall and in every fight scene. They are really more like the bad guys in the story. When they broke out of the orphanage, everyone chased them. Mr. Jennings offered a year of work off to any of the other orphans who caught the kids who escaped. There was so much action! And they forgot something and had to go back, and someone got caught and stuff, and it was really exciting. On a scale of one to 5... One being that book you didn't finish last year because it was boring, and five being the best book you ever read, how would you rate "The Three Thorns?" There was a lot of action and a lot of chasing, but the part where they were being taken to the castle didn't have a lot of action. There should have been some fight scenes to make it more interesting. Would you be interested in reading the next book? Yes. They ended it in a way that made me say "Omigosh I have to see what happens!" Yes, to my friends that like action adventure books. There you have it, directly from my son. I have to say that each day he finished reading with a smile on his face. He is easily bored, and there are a lot of books in his "did not finish" pile. He does not put up with books that don't keep his attention. I always love a fantasy book, and I especially love discovering new fantasy series. I was really excited to read this one, since it starts in our world and sounded like it ends up in a completely new world. And I was really surprised by how much I enjoyed The Three Thorns! Although it took me a little bit to get into, since this book jumps around to introduce us to the This review and more can be found at The A P Book Club! Although it took me a little bit to get into, since this book jumps around to introduce us to the three brothers. It was just kind of disorienting because it doesn't give much warning... I mean, I guess it changes at the chapters, but sometimes I just wasn't expecting it and had to backtrack a little bit so that I could figure out what was going on. After I got into the story though, I really enjoyed jumping around to see where all the brothers were! I also really enjoyed how hard it was to get all of the boys together once they finally end up in the same world. Even though they get together in our world, things happen and they split up again and I felt like this is just the story of their lives. They're born brothers, given up as orphans to three different families/people, get put back together, get split up again, have to find their way back together... I'm really hoping this cycle eventually gets broken! Even if it's just for their own sanity! The world building was very interesting, although I wish there had been a little bit more. The creatures are all imaginative and unique, and surprisingly easy to picture. The assassins are incredibly terrifying and not something I would ever want to have to fight. I received a digital copy of this book from Chapter by Chapter for a blog tour in exchange for my honest and unbiased review. All are my own opinion and is not compensated by any individual, organization, or company. This might contain minor spoilers. 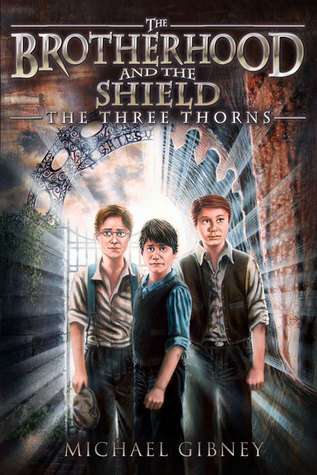 The Three Thorns is a story about three boys abandoned at birth in three different unsuspected places. But no one knows that they were not really from this world and were abandoned only to be protected and hidden until the right time for t I received a digital copy of this book from Chapter by Chapter for a blog tour in exchange for my honest and unbiased review. All are my own opinion and is not compensated by any individual, organization, or company. This might contain minor spoilers. The Three Thorns is a story about three boys abandoned at birth in three different unsuspected places. But no one knows that they were not really from this world and were abandoned only to be protected and hidden until the right time for them to know the truth and avenge what is needed to be ‘avenged’. The plot is actually interesting. Three brothers, who did not know each other, did not know who they are themselves and did not know who those people trying to kill them, are joined together in battles and adventures in another world. It is definitely something that will make readers wanting to read it. But, I am not really that pleased about the characters. I mean they looked really nice and fitting but I felt that I really did not know them. The whole time reading the book, it felt strange. I was looking for more stories from each character. I was not content on how they were introduced. I felt like they are lacking more on the in-depth characteristics. They are all enjoyable, yes, but if I knew them enough I might enjoy it more. The creatures and other entities are pretty amazing. Their entry on the story gave such a big boost and made their parts an important event for the book’s progress. The world setting is potentially amazing. But there are so many things I felt is not described and told. In fantasy books, I am looking for a very clear and vivid description of the world settings. I did not find that in this book. So, I am hoping that the next installment of this series will make me learn and know more about the three brothers and the world they have. I will recommend it to kids for I know that this book will do better for them than me. This book has exciting adventures and battles that I am sure kids will love. What I Thought- Wow – what a great opening book for a new series. This was a fun book that really keeps you reading. There is plenty of action to keep the reader interested and a great plot and terrific writing to get you into the story. Tommy, Benjamin, and Sebastian are great characters that you really cheer on. The setting of the “new world” (the magical world they get taken to right after they meet each other) is fantastically described and makes you wish that you were there! Mr. Gibney’s wr What I Thought- Wow – what a great opening book for a new series. This was a fun book that really keeps you reading. There is plenty of action to keep the reader interested and a great plot and terrific writing to get you into the story. Tommy, Benjamin, and Sebastian are great characters that you really cheer on. The setting of the “new world” (the magical world they get taken to right after they meet each other) is fantastically described and makes you wish that you were there! Mr. Gibney’s writing is solid – he gives you enough background to have you understand the characters and plot without dragging the story down with too many details. I like how everything falls into place as the story goes on. The characters make you smile and feel that the Brotherhood is in good hands. The writing and dialogue is realistic. Mr. Gibney is a great author who I can’t wait to read more from. The website for the new series – The Brotherhood and the Shield – is worth checking out. There is information about the first book and the series. You can also hear actor Chris R Wright read excerpts from book 1. A great fantasy adventure that has you caught up in the moment wanting to read more. This has everything you expect to find in a fantasy novel trolls, goblins, magical creatures, and battles. I also like the aspect of the three orphans coming together against a evil force. A great middle grade novel that not only kids will like but an adult or two will enjoy reading as well. I won The Three Thorns in a giveaway from a blog that I read. The Three Thorns by Michael Gibney is a story of three brothers, Tommy, Benjamin, and Sebastian, orphaned and separated at birth. They learn of their true destiny in this exciting middle grade fantasy. This story has lots of action and kept me interested in finding out what would happen next. In this Lord of the Rings meets X-Men fantasy world and first volume of the Brotherhood and the Shield series, the action will keep middle grade readers on the edge of their seats as they follow the heroes adventures. The author has created a clever and imaginative fantasy world with all the fantastical creatures and perils you’d expect. A welcome addition to the fantasy genre. Michael Gibney began working in restaurants at the age of sixteen and assumed his first sous chef position at twenty-two. He ascended to executive sous chef at Tavern on the Green, where he managed an eighty-person staff. He has worked in the kitchens of Morgans Hotel Group, 10 Downing in Manhattan, and Governor in Brooklyn’s DUMBO, among many others. Over the course of his career, he has had the Michael Gibney began working in restaurants at the age of sixteen and assumed his first sous chef position at twenty-two. He ascended to executive sous chef at Tavern on the Green, where he managed an eighty-person staff. He has worked in the kitchens of Morgans Hotel Group, 10 Downing in Manhattan, and Governor in Brooklyn’s DUMBO, among many others. Over the course of his career, he has had the opportunity to work alongside cooks and chefs from many of the nation’s best restaurants, including Alinea, Per Se, Eleven Madison Park, Daniel, Jean Georges, Le Bernardin, Bouley, Ducasse, Corton, wd~50, and Momofuku.